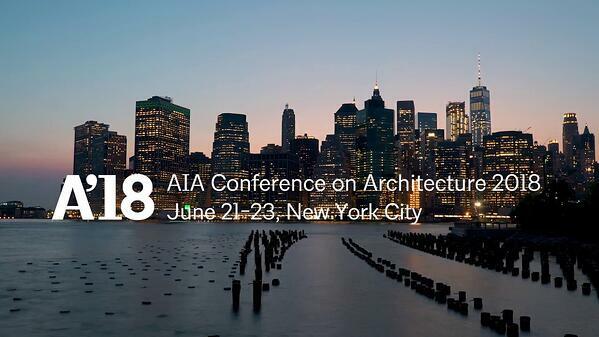 ADA experts at Amramp will showcase ADA-compliant building accessibility solutions to the American Institute of Architects (AIA)’s 23,000+ design professionals at its immersive AIA Conference on Architecture 2018 from June 21-23 at the Javits Center in New York City. As the largest annual gathering of architect professionals in the US, attendees of this "Blueprint for Better Cities" event will learn how leading industry experts are making a positive difference in cities around the world. The event will focus on architecture that considers health and resilience as critical factors, with an emphasis on taking care of ourselves, as well as the environment. 500+ sessions, including "Your Future Self: Addressing Design With Age Simulation" and "Designing, Building & Evaluating Healthy Buildings," and "Holding Ourselves to Higher Standards: Healthy Materials Every Time"
Additionally, the Architecture Expo will feature expo floor sessions hosted by more than 130 innovative building product manufacturers, including Amramp. Amramp team members will be on-hand to showcase breakthrough products -- wheelchair ramps, stair lifts, pool lifts, vertical lifts, portable showers, and more -- to improve patient experience and support the work of health-focused building professionals across the county. Enjoy this cutting-edge conference agenda, and don't forget to see best-in-class accessibility solutions at Amramp’s exhibitor booth! If you have mobility concerns, living in a multi-level home doesn't have to be an issue. 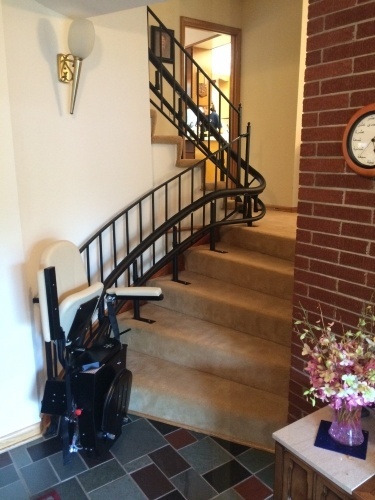 Continue living safely in your own home with a home stair lift. "Now that I used my chair lift for a while, I want you to know that it has given me more things I can do," Mike wrote. "I can get to the car, go to the mail box, and let my dog out." Don't let stairs create a barrier in your home. Amramp's quick installations and affordability of home stair lifts and outdoor stair lifts make accessibility a breeze. Amramp stair lifts can fit in any space! Whether you're looking to get up 5 stairs or 15, a curved staircase, or a straight one, Amramp can make it work. Amramp has curved and custom units available to ensure that you have access to every part of your home. Stair lifts can face the weather! Amramp offers both indoor and outdoor models. The weatherproof design ensures your total mobility. You are in control! Amramp's stair lifts are easy to use. Onboard panels and remote controls allow independent use. Comfort is key! Amramp's unique design ensures not only your comfort, but also your security. After all, this is about restoring your comfort in your own home. Stair lifts are quickly installed! Amramp prides itself on quick installations because we understand the importance of safe mobility. Stairs don't have to be a barrier in your home. A quick installation can help you stay in your home longer. Wheelchair ramp manufacturer and installer Amramp offers innovative accessibility products, including the ADA-compliant, patented modular ramp system as well as home stair lifts and outdoor stair lifts. On-site estimates are free and installation is generally within days, often within 24 hours. Amramp's stair lifts can help you regain your freedom in your own home. 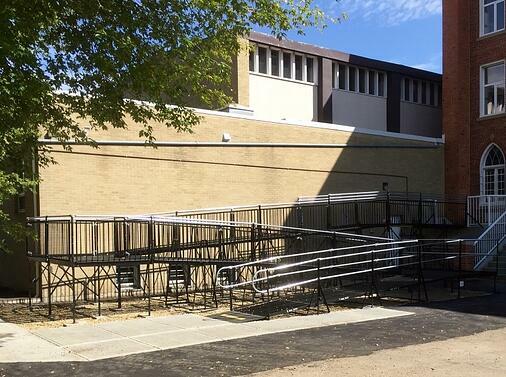 Lorne Wensel and #Amramp Alberta has just completed a 107-foot #barrierfreeaccessramp on the historic #St.FrancisofAssisi Facility. This was the original friary for the Franciscan Order in #Edmonton. The historic 1925 building features Gothic-arched windows on the ground floor and a metal cornice around the roof line. The building has been renovated and re-purposed by the John Bosco Child and Family Services Foundation. The foundation provides suitable facilities for not-for-profit organizations, assisting them in providing human services to individuals and families, whom -- through no fault of their own -- are struggling with many challenges. The building now has a barrier-free access ramp and will also have a new interior elevator. Once all the renovations and upgrades are completed, not-for-profit organizations will be using it for office space. Amramp Alberta was proud to work on this historic Alberta structure and honors the foundation's support to the Edmondton community and beyond. Buy or rent expert-installed wheelchair ramps. Fire-Ready Tip 1 – Develop a fire-escape plan so you know what to do. According to an NFPA survey, three-quarters of Americans have a home-fire escape plan, but more than half never practiced it. When crisis happens at home, work, or anywhere you routinely spend time, you don’t want to have to figure out what to do while in a state of panic. In addition to evacuation routes, the NFPA Fire Prevention Week Campaign focuses on having fully operational smoke alarms in your home so that in the event of a fire, particularly one in the middle of the night, you are made aware soon enough to get out. Fire-Ready Tip 2 – If possible, plan for the possibility of not being able to reach your wheelchair. 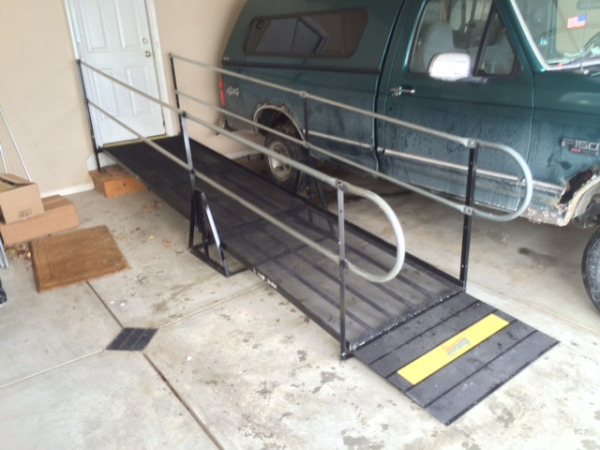 Amramp installed a modular wheelchair ramp for a woman who later suffered a fire in her home. She didn't have time to get to her wheelchair, so she held onto the furniture to make it to the front door. She was able to use the railings on the ramp to get to safety. 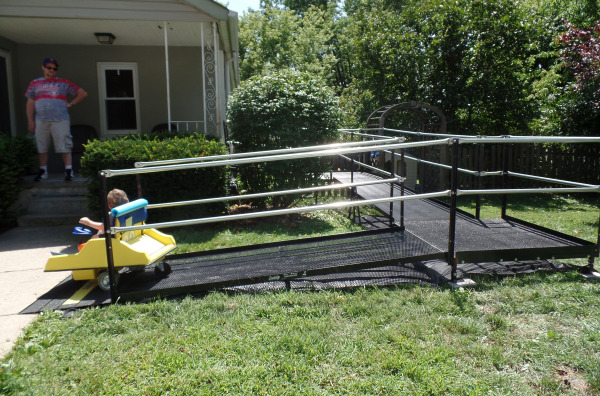 Fire-Ready Tip 3 – Invest in a wheelchair ramp and other equipment that will withstand high heat. In the case of the woman mentioned above, soon after she made it to safety, the aluminum front door melted. This is a dangerous failing of other ramps on the market that are made of aluminum or wood. In the intense heat of a fire aluminum melts and wood burns. Due to the durable steel that Amramp ramps are manufactured with, once they scraped the melted aluminum off, they were able to dismantle and reinstall the ramp at her new home the day after the fire. Another Amramp client, who was a veteran, suffered a house fire in Hazelton, PA. He and his wife were able to escape using their Amramp wheelchair ramp provided through the Department of Veterans Affairs. Another man managed to escape his quickly engulfed home in Fair Oaks, NC, by using the Amramp modular wheelchair ramp provided by his church. His ramp was also dismantled and re-installed at his mother’s house right away after the fire. Per design standards, wheelchair ramps are a “means of egress” in a fire and should be fireproof. Amramp modular ramps are made of the same steel used in fire escapes and provide a stable, fireproof exit in the case of fire. Contact Amramp for independent test lab data on ramp-fire safety. Home fires killed an average of eight people every day in 2013; half of these deaths resulted from fires reported between 11 p.m. and 7 a.m., when most people are asleep. It is crucial to prepare yourself, your family, and your home so that you have the best possible chance to escape a fire should one occur. It is even more vital for wheelchair users and people with mobility concerns. For more information on how to prevent a fire in your home check out the NFPA website. Four-year-old Nate can now get from his home into his Glenside, PA, yard, just like kids without Spina Bifida, thanks to grants from United Cerebral Palsy and the Spina Bifida Association. 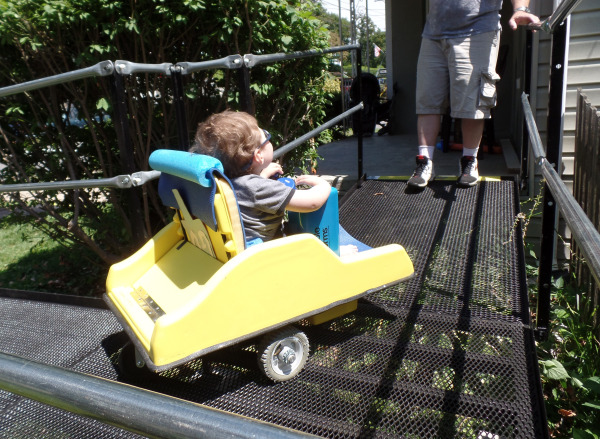 Nate’s parents, Jamie and Stephen worked with both UCP and SBADV to secure grants to fund the ramp and installation. The family then contacted Nick Marcellino at Amramp Philadelphia in June to ask if Amramp is willing to work with third-party organizations. “We performed the evaluation and proposal; when the funds came through a month later, we got to work,” explained Amramp Philadelphia owner-operator Marcellino. Spina Bifida is a condition that occurs when the spine of a baby fails to close, creating an opening, or lesion, on the spinal column. This opening can lead to nerve damage in the spinal column, which then results in varying degrees of paralysis. 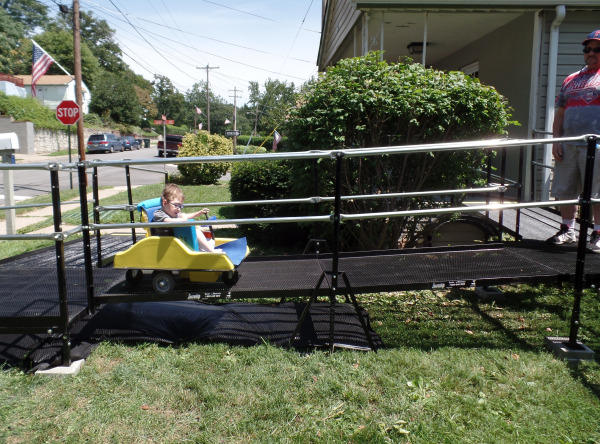 Amramp’s patent-pending steel modular wheelchair ramp connects the family’s porch to the front yard, comprising two 4-foot-by-4-foot platforms and 25-feet of ramp. Amramp experts arrived at 9 a.m. and installation was complete in about a half-day, by 1 p.m.
“Thank you so much to the two gentlemen who installed the ramp (and the other gentlemen who were there for the evaluation previously), who were so friendly professional, efficient, and were so good with interacting with our son,” said Jamie. Every ramp or accessibility product that we install is very meaningful to the Amramp team in all 45 locations across North America, because we know that our efforts are improving individual’s lives and their loved ones, too. 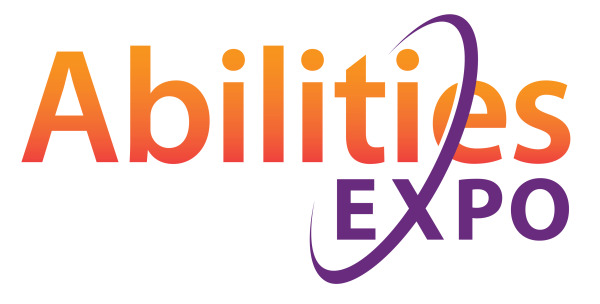 Recap of Abilities Expo 2015 in Our Hometown of Boston! Amramp had an exciting weekend at this year's Abilities Expo, which was held the Boston Convention and Exhibition Center (Hall C) September 18-20. This annual convention is unique in that it is geared toward all ages and all disabilities. There was 3 days of workshops, cutting-edge assistive technology, and fun activities for the whole family. Everyone from children with disabilities to aging seniors was welcome and the event was free. Exoskeleton Technology: A Step for Healthy Living - discussed the history and the future of exoskeleton technology, and how it has affected people who have suffered a spinal cord injury. 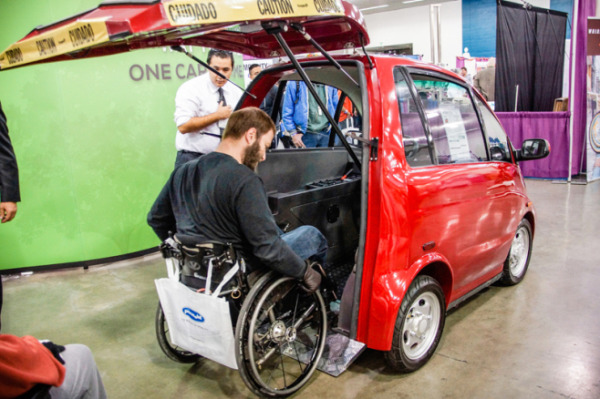 How to Select the Right Accessible Vehicle for You - helped attendees navigate the complicated world of purchasing vans and accessible modifications. Wheelchair Travel: You Can Do It! – Attendees learned everything you need to know to travel well as a wheelchair user, discussing everything from how to board plane to what vacations best lend themselves to travelers with mobility concerns. Service Dog Demonstration - Attendees met several assistance dogs and learned how they help their human partners achieve independence. Meet Paralympian Victoria Arlen! – Victoria Arlen, who after being in a vegetative state for nearly four years went on to win both gold and silver medals in swimming at the London Summer 2012 Paralympics, was in attendance at this year’s Abilities Expo. She signed autographs and shared her latest exploits with Project Walk Boston. Art Happening! Giant Floor Mural! 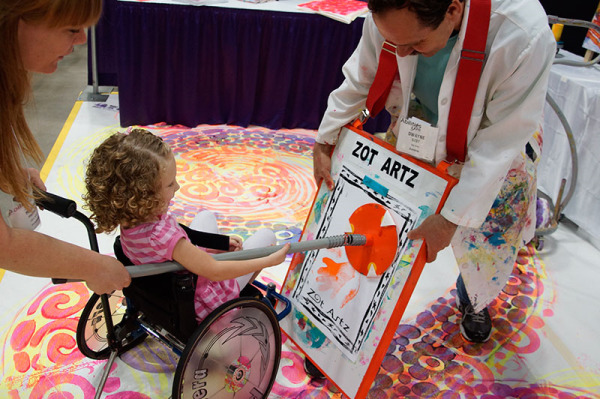 – Artists and non-artists alike joined Zot Artz Art Happening where they created a floor mural using adapted art tools for walking, rolling, and stamping. Walk and Roll Dance Team Performance – Walk and Roll Foundation’s talented wheelchair dance team kicked off the day with a high energy performance and then invited attendees to join them on the dance floor to learn a few moves themselves. Cosplay Parade Hosted by Misa on Wheels – All ages joined in the first ever Abilities Expo Cosplay Parade hosted by Misa on Wheels, New England’s Most Notable Cosplayer on Wheels. Everyone came dressed as their favorite character were able to meet fellow cosplayers from the disability community. We had a great time at Abilities Expo and are looking forward to next year! The 70th Annual Workers’ Compensation Educational Conference (WCEC) and the 27th Annual Safety and Health Conference is being held August 23-26, where thousands of attendees will be descending upon the Orlando World Resort Marriott in Orlando, Florida, to study and explore changes in the national workers’ compensation and safety industries. A talk with industry keynote speaker Deborah L. Michel, president of Helmsman Management Services, and, retired NFL player and former Olympian, Keynote Speaker Herschel Walker. Workplace Safety & Health: This series of classes will be going over all the different facets of maintaining a safe and healthy workplace, from pre-employment testing to accident investigation. Medical Issues: This Mini-Med School, which is popular with adjusters, attorneys and nurse case managers, will be teaching attendees how to identify prescription and illegal drugs that are being abused by workers which cause increased risk of workplace injuries and the legalities surrounding that. Disney's SyncLink™ Technology: Since you can't help but immediately think Disney when you think of Orlando, as a special treat, attendees will be given a peek behind the curtain of Disney's revolutionary SyncLink™ Technology, a wireless, synchronized data management system that can give real-time compliance and food safety data. Explore the complete program detailing the hundreds of speakers, presentations, and exhibitors on the WCI website. Attendees can also earn continuing education (CE) credits. A complete list of all courses of approved for credit will be available at the Continuing Education desk in the registration area. Amramp is honored to be invited to exhibit at WCEC 2015. 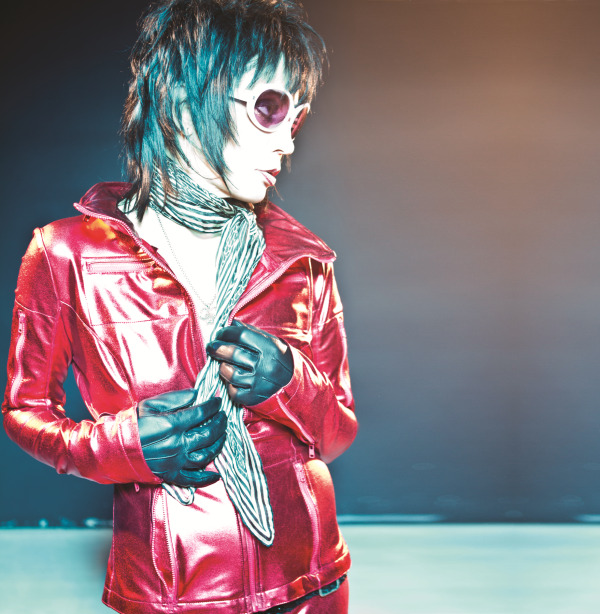 Not only will we be demonstrating our latest products and advances in accessibility, but, in honor of Joan Jett and Blackhearts, the exhibit hall is also going to be decorated in an ’80s/neon/rock ’n’ roll theme. With over 8,000 attendees and 450 exhibitors, it promises to be a great time. We hope to see you in Orlando! The Wounded Warrior Project (WWP) is an organization dedicated to assisting military service members injured on or following September 11, 2001, through unique programs and services. Through the five core tenants of "Fun, Integrity, Loyalty, Innovation, and Service" (FILIS), the Wounded Warrior Project seeks to empower and give back to veterans who have physical or mental injuries, illnesses, or wounds. One popular program that the WWP hosts each year is the Soldier Ride, a cycling event during which participants travel to various cities around the country and invite veterans and wounded service members "to use cycling and the bonds of service to overcome physical, mental, or emotional wounds." The Soldier Ride is invigorating, inspiring, and a great way to meet new friends, get some exercise, and enjoy a day of energetic outdoor fun. President Barack Obama got involved in the fun at April’s recent DC Soldier Ride by greeting cyclists, cheering them to the finish line, and generating laughs with his signature jovial sense of humor, joking about yoga “warrior” poses. The Soldier Ride welcomes and accommodates veterans of all mobility levels. Wounded Warrior provides adaptive equipment free of charge to participants, including state-of-the-art adaptive hand cycles, trikes, and bicycles. The program takes place over four days. Day one includes orientation/bike-fitting and meet-and-greet events. On day two, participants go on a short program ride to test out their new equipment, while day three is the intense, exhilarating long-program ride covering 25-mile or 50-mile courses. Locals and supporters will come out to cheer the warriors as they pass. The final day is for wrapping up the event and saying goodbyes to new friends. If you are an injured veteran who wishes to join WWP and participate in program such as the Soldier Ride, click here to register online.